‘Mary and the Witch’s Flower’ is the first film to be released by Studio Ponoc, a new studio that has risen from the ashes of iconic Japanese animation house Studio Ghibli (albeit since then Ghibli have announced a new release, taking the Steven Soderbergh approach to ‘retirement’). It’s based on a 1971 novel by Mary Stewart called ‘The Little Broomstick’ and it tells the story of Mary, a young girl in England who finds a magical flower that gives her the power to become a witch. In many respects this is template Ghibli material, focusing on a young central character who is drawn into an enchanting and magical plot, and it’s a solid start for Studio Ponoc and former Ghibli director Hiromasa Yonebayashi. The film’s plot kicks into gear once Mary discovers the flowers, taking her on a journey into a magical realm where what appears to be an island floating in the sky hosts a Hogwarts-esque college of magic. This welcoming, advanced college turns out to be more sinister than it first appears, leading Mary on a quest to save her friend and prevent the college’s Madame and Doctor getting their hands on the valuable flowers. Yonebayashi visited the UK to get a better feel for our countryside and it shows in the final product, with the flowers and colours of nature shimmering across the screen every bit as much as the inventive creations of the fantasy world. It’s a film full of life and colour and the simple plot is easy to be drawn into, even if it lacks the ambition of some of the finest works of its predecessor studio. 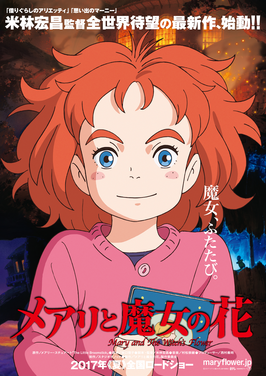 ‘Mary and the Witch’s Flower’ is an enjoyable piece of anime for kids and adults alike, and whilst it doesn’t hold a candle to the best of Ghibli, it nevertheless shows there is a strong future ahead for Japanese animation.